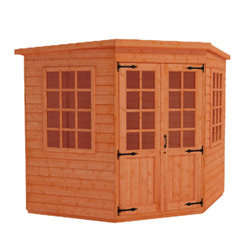 Find out more about our Garden Corner Sheds range. Conceived to be tucked within a corner without intruding on your garden yet extending your storage space or creating a summer room, our corner sheds are manufactured by hand on our purpose built site here in West Yorkshire. Building sheds for over 20 years we understand how important it is to increase space without overlooking the aesthetics. Hand selecting the boards from a selection of high-quality European softwoods and covered by our timber guarantee, the Shiplap tongue and groove panels are robust enough to ensure that you will enjoy it for years to come. Corner Sheds are a popular choice as they look beautiful and can be used as a fantastic garden room and attractive addition to a garden. 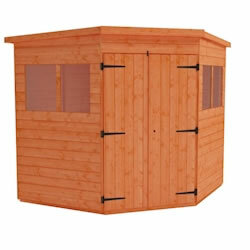 The Tiger Deluxe Corner Shed is an ideal storage solution and can be neatly tucked away in your garden. Offering you and your family more garden space to play and enjoy. 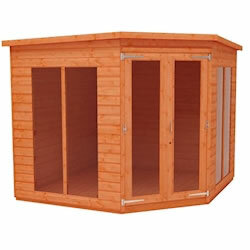 The Tiger Corner Summerhouse is an attractive storage solution that can reinvent a garden! As the Tiger Corner Sheds are so astatically pleasing they can also be a fantastic place to think and work. Many Tiger Sheds customers use this space as a creative den to write or as a personal room to fulfil hobbies and relax. To provide some inspirational ideas The Hip Horticulturist created a post on She Shed Vs Man Caves using The Tiger Corner Summerhouse. All of our products come with free delivery across most of the UK.